If you're here, you understand that the medical school interview is the final obstacle between you and an acceptance to medical school. You understand how important it is to be prepared for the gauntlet of questions that the interviewer can ask you. You understand that the mock interview is THE BEST method of preparing for the interview. I've conducted countless mock interviews with students preparing for their interview day and time and time again, the feedback that I've received has been incredible. 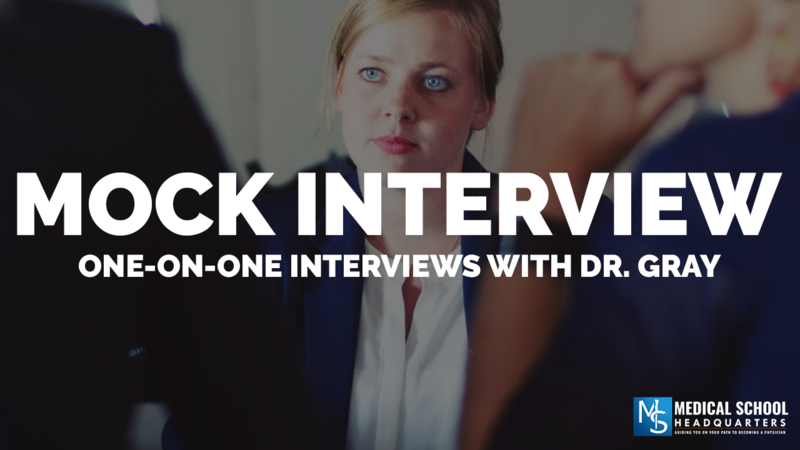 I know that conducting mock interviews with me will get you prepared to crush your interview. Over Skype, we'll meet for 45 minutes – about 25 minutes of questions and 20 minutes of feedback. I love the feedback—that's where you learn how to take your interview skills to the next level. I don't sugar coat it! Most students sign up for 3 sessions with me near the beginning of interview season to help them prepare for any interview that may come their way. There are several types of interviews that you may encounter, the open interview, closed interview and the MMI. You may even get a mix. I'll get you ready for all of them. Don't wait until you know you have an interview, because by then it may be too late. I may not have availability or you may not have enough time to practice what you need to based on my feedback. Medical schools interview only a small percentage of those that apply, and still, only a percentage of those students are accepted. Preparation for your medical school interview will help you stand out and be noticed. If you have an interview, the school KNOWS, based on your application, that you can handle it. Now they just want to make sure that you can handle yourself in a professional setting and that you can communicate your thoughts well. Just because you have a 4.0 GPA and a 520 MCAT does not mean you're a shoo-in. If you are at this point, consider yourself on a level playing field with every other applicant there for the interview. The INTERVIEW will determine if you get an acceptance or a rejection, nothing else. Think about every major actor, sports player, singer or dancer. Do you think they got to be the best because they just willed it to happen? No—they practiced. And they practiced hard! They not only practiced, but they received coaching from experts to help bring them to the next level. That's why I'm here for you. For open interviews, you'll send your application so I can review it, just as an admissions committee member would. Your questions will be tailored based on what's in your application, not just a list of generic questions that can be asked to any student. “After three interviews at two schools, I can say with confidence that the core questions Ryan covered came up in each and every conversation. I spent quite a bit of time re-watching our mock interview tape. The notes I made on my answers and Ryan's advice helped me prepare, as well as FEEL prepared. Feeling prepared for interview day decreased my anxiety, enabling me act like myself and talk with confidence about my candidacy.” – Danny M – UC Irvine Class of 2020. You can see my schedule (but please don't actually schedule there, it will be automatically canceled) here - https://calendly.com/medicalschoolhq/mshq-availability. I am available for calls Tuesday and Wednesday with the first call at 10:00 am PST and the last one at 2:45 pm PST. I don't do any nights or weekends. LIMITED IMMEDIATE AVAILABILITY - Please see the link at the bottom of the post to see the availability. 3 one-on-one sessions. We'll cover what you need - open, blind, MMI or a mix of all of them. Save 20% off the one session price. Includes access to the interview video course. 2 one-on-one interviews. We'll get you prepared for your medical school interviews. An over 15% discount compared to one session price. One 1-on-1 mock interview session. We'll do the interview in whatever format you want.